Did you know that March is the 32nd annual National March Frozen Food Month? It’s a month to celebrate all the delicious possibilities that your freezer has to offer, while taking a fresh look at frozen! There’s more to the freezer aisle than just ice cream and frozen pizzas. There are lots of basic, prepared ingredients you can incorporate into everyday recipes, as well as pre-made meals for weeknights that are just way too busy. To end Frozen Food Month, and because it’s the beginning of spring, I decided to do some spring cleaning in my freezer. You can check out EasyHomeMeals.com for some great tips on how to clean out your freezer. I started by tossing everything in my deep freezer that had expired or had freezer burn. Then, because my deep freezer doesn’t defrost itself, I removed the excess ice and then organized all my frozen foods for easy access. I want to make sure I have lots of extra space in my deep freezer because right now I’m in the planning stages for make-ahead freezer meals that my husband will be able to easily prepare once the baby arrives. While cleaning out my freezer, I found lots of frozen fruits that I had bought for smoothies that I had forgotten about, and some puff pastry. I always like to have puff pastry on hand, because it’s so versatile! 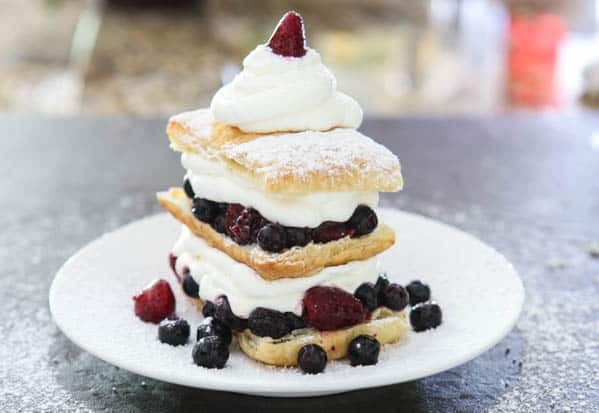 So, with the addition of some frozen whipped topping, I decided to put together these quick and easy Mixed Berry Napoleons. To start these indulgent desserts, I just defrosted my puff pastry according to package directions, and then cut each sheet into 6 equal rectangle shapes. Then, I baked them to a nice golden brown, per package directions, and let them cool completely. 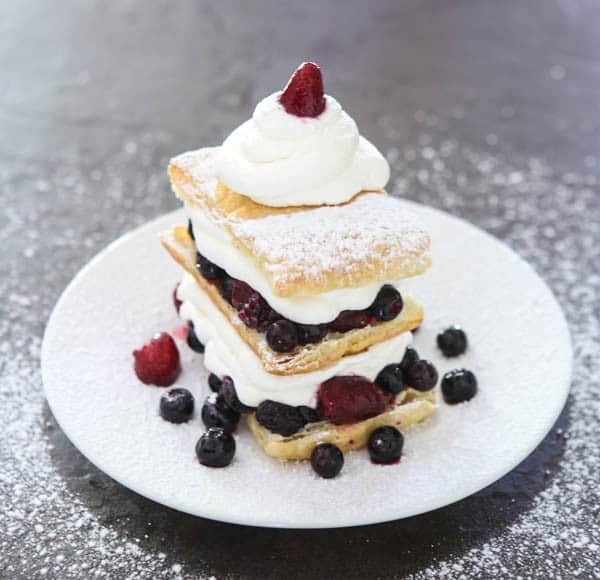 To make the Napoleons, I layer my pastry cream, which is a combination of cream cheese and Cool Whip, with the mixed berries and crisp puff pastry. It’s so easy, and looks way harder than it actually is. To garnish, I just sprinkle on some powdered sugar. Now, how cute is that? Don’t forget that the frozen food aisle also has healthy produce, perfectly-portioned meals and a variety of ethnic cuisines and dishes to meet various dietary needs/culinary preferences. What I want for my family is the same as you – real, simple, nutritious, delicious, affordable and customizable meals and snacks. And, all of these needs can be met in our grocer’s freezer section. To celebrate National March Frozen Food Month, the National Frozen and Refrigerated Foods Association (NFRA) is giving away 4 glass-top chest freezers during the month of March! You can enter to win a beautiful Hussmann freezer here, or on EasyHomeMeal’s Facebook page here. They are also having an awesome sweepstakes and some lucky person is going to win a cool $10,000! Be sure to enter here! The $10,000 sweepstakes ends April 27th. For more mealtime inspiration, visit www.EasyHomeMeals.com and follow on Facebook, Twitter and Pinterest too! Be sure to also visit the March Frozen Food Month 2015 Sponsoring Brands for product information, tasty recipes and meal ideas. 1 sheet of Pepperidge Farm Puff Pastry, from frozen, defrosted according to package directions, and cut into 6 rectangles. Bake puff pastry squares according to package directions. Combine whipped cream cheese, powdered sugar and Cool Whip. Beat with the electric mixer until well-incorporated. Set aside. After puff pastry is done, use a bread knife to halve pastry lengthwise to form two thin pastries. 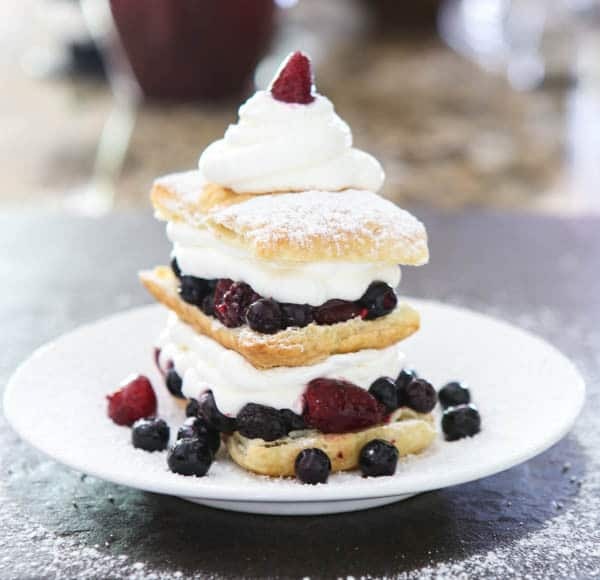 Layer a piece of puff pastry, pastry cream and berries. Add another layer of pastry, pastry cream and berries. End with another layer of pastry and top with a dollop of pastry cream. Garnish with powdered sugar. Goodness, these are just stunning! Such a lovely dessert! I need to clean out of my freezer – I just said that yesterday to my mother in law! This is such a pretty dessert! I think that I always have puff pastry and at least one type of berry in my freezer, too. These napoleons are so beautiful…and impressive to look at! I am thinking Mother’s Day brunch! Puff pastry and berries are so perfect together. Beautiful presentation and photos! That sounds like an awesome giveaway! And these napoleons look so perfect. Gorgeous! I saw the picture and thought oh my that looks delicious! Great contest, thanks for letting us know! What a beautiful Napoleon! I keep frozen puff pastry on hand all the time. So easy to make an easy and elegant appetizer or dessert when you have it readily available. What a beautiful looking dessert! I’m totally guilty of needing to give my freezer a good cleaning. I have tons of frozen fruit that would be perfect for a dessert like this….yum! We just cleaned out our freezer too – man, that felt good! We always keep a selection of mixed berries in our freezer and this would be the perfect way to use up some of them! My freezer is stocked with frozen fruit! I’m really the only one here that eats fruit so buying frozen fruit is so much better for us. I love it for smoothies too! However, next I’m making this beautiful Napoleon!! I mostly keep frozen fruit in my half of the freezer 🙂 (the other half is stacked with meat haha!) so I’m totally ready to make this beautiful dessert! This Napoleon is a dream come true. Seriously delicious!! I love your photos!! That looks incredible!!! We always have frozen fruit in our freezer — I love to use it for smoothies in the morning.